Replenishing your body with the right food after working out helps your muscles to recover and rebuild more quickly, but who knew refueling could include mind-blowingly delicious and protein-packed chocolate truffles? On a recent fabulous Escape to Shape Destination Detox trip in Hudson New York — a seven-day retreat packed with tons of hiking, yoga, boot camp classes, and super-clean food — I had the pleasure of discovering these treats. Later I was able to make them at home and happily re-achieved chocolate nirvana. Resident Escape to Shape nutritionist and chef Nicole Gimmillaro created these wonders — sans butter, cream, or sugar — and I’m happy to share them with you. They will easily give you the incentive to run that last mile, and are low in calories while high in nutrients. 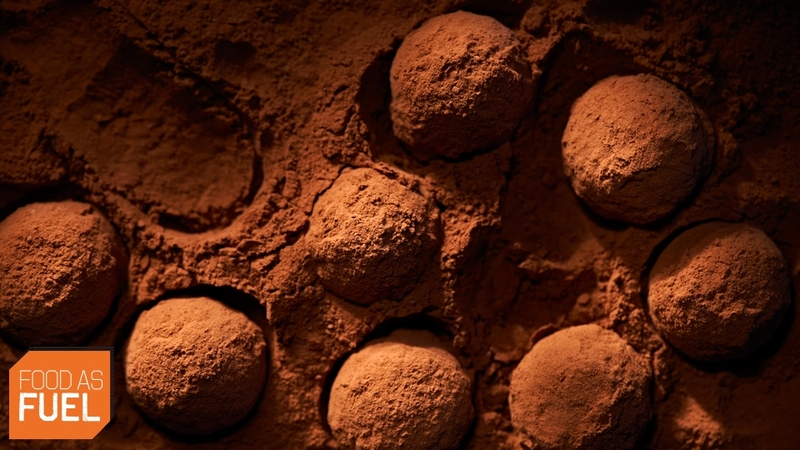 These truffles prove that eating well extends far beyond quinoa and smoothies. After all, don’t athletes earn their just desserts? Combine all ingredients in food processor and pulse to form a sticky paste. If mixture is too dry to hold together, add 1 or 2 tablespoons orange juice. Pinch off small pieces of the mixture and form into truffles. Roll in cocoa powder to coat. These will keep in the refrigerator for at least a month. Enjoy!